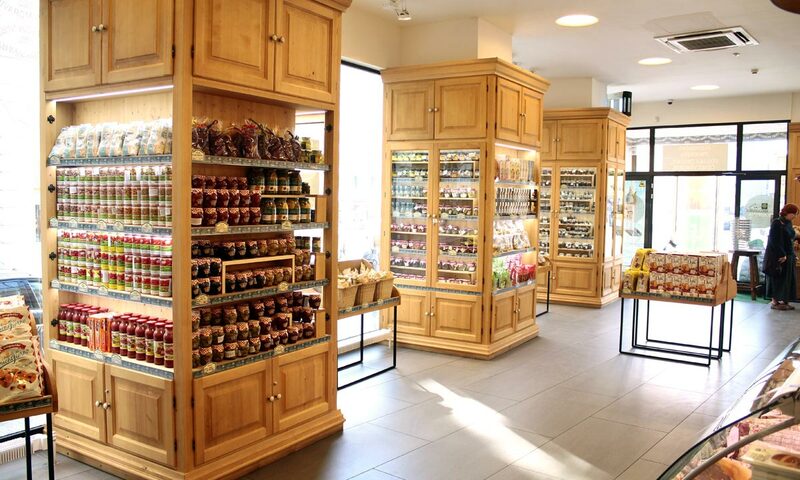 Every product is made from our factory in Litovel sourced from ecologically sustainable farms. 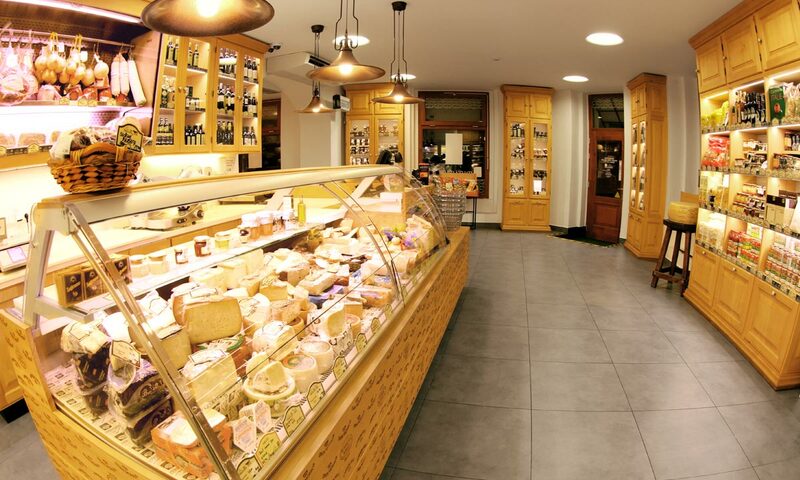 The main product is of course Gran Moravia aged cheese! 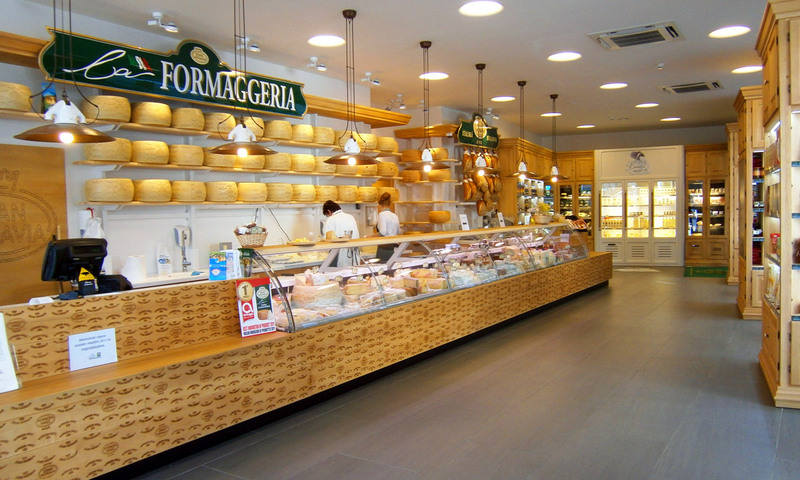 Products from the series “Directly from our dairy factory” are also loved by customers, mainly ricotta, mozzarella, curds, milk, yogurt, flavoured whey and fresh butter. 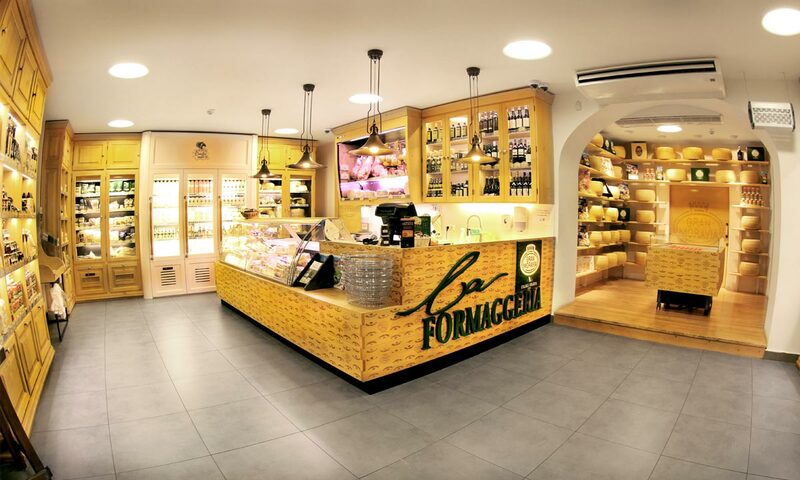 Products of this series are made with the expectation of the daily customers’ demand and are delivered to La Formaggeria Gran Moravia stores the next day after their production… so our customers can really enjoy their fresh taste. 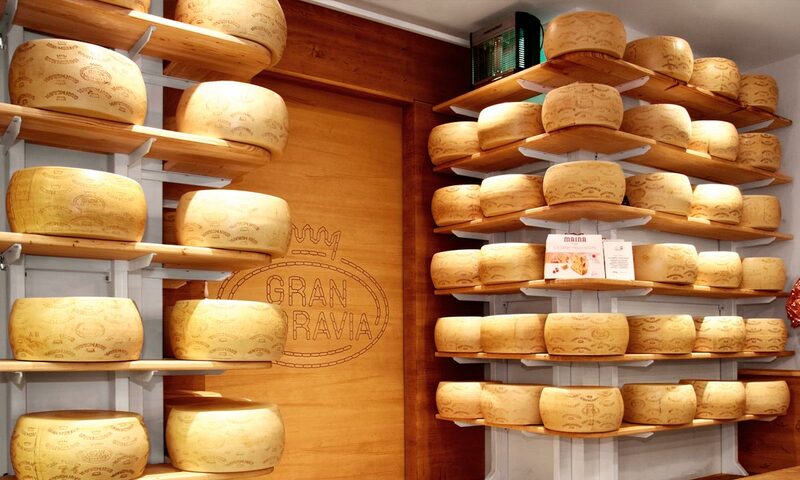 The Gran Moravia is a hard cheese firmly packed into large forms and aged for several months. It is made in our dairy factory in Litovel from high quality cow’s milk. It has a granular texture, an unforgettable taste and a variety of uses You will ricognize the original Gran Moravia by the stamp printed on its crust. 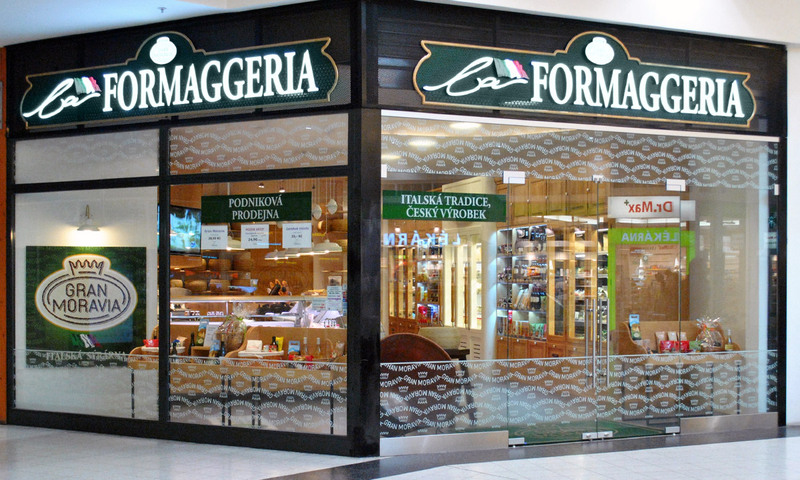 At La Formaggeria Gran Moravia, it is sold both fresch shaved or in vacuum-sealed packages. Food energy 1573 kJ/378 kcal; total fats 28 g; saturated fats 20 g; total carbohydrates 0,6 g; sugar 0 g; protein 31 g; salt 1,4 g.
Caciotta cheese is one of the most traditional products of Italian cooking. In our Dairy Factory in Litovel, we produce three types of Caciotta cheese: tender fresca, fresh pepata with pepper and diavoletta with hot pepper. This cheese is widely used in hot and cold dishes; it can be served with fragrant red or white wines. And also, Caciotta with pepper perfectly accompanies dark beer. Food energy 1520 kJ/367 kcal; total fats 26 g; saturated fats 15,2 g; total carbohydrates 2,9 g; sugar 2,9 g; protein 23 g; salt 1,2 g.
Fresh butter is made in our dairy factory in Litovel from high quality cow’s milk cream and then sold by weight at La Formaggeria Gran Moravia shops. The fresh butter is then sliced in various portions directly in our shops in order for each customer to choose the portion of butter that best suits his needs. Food energy 3080 kJ/750 kcal; total fats 82,7 g; saturated fats 54,6 g; total carbohydrates 0,7 g; sugar 0,7 g; protein 0,6 g; salt 0 g.
Furfante cheese – soft cheese with a thin, smooth and elastic crust and tender taste. This Cheese is made from pasteurized cow milk. It has a short maturation period (approximately 21 days). 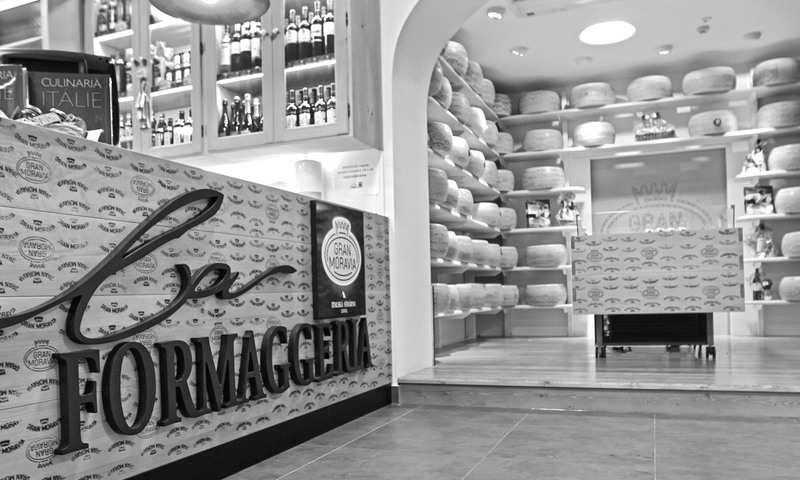 In La Formaggeria Gran Moravia stores whole heads of this cheese are delivered and cut directly behind the counter on request of customers. Furfante is an excellent table cheese, which is also suitable for preparing baked vegetable and meat dishes. Food energy 1490 kJ/357 kcal; total fats 28 g; saturated fats 18,3 g; total carbohydrates 2,7 g; sugar 2,7 g; protein 24 g; salt 1,1 g.
Our Giuncata is a fresh cheese with a refined flavor and a soft consistency. Since it is made from cow’s milk, it retains its taste and color typical for the fresh milk. 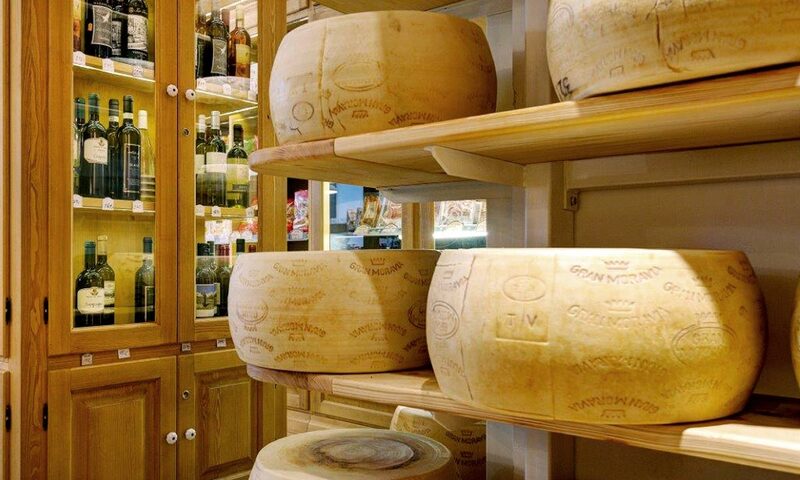 Moreover, considering its high digestibility, the Giuncata is the perfect cheese for children. 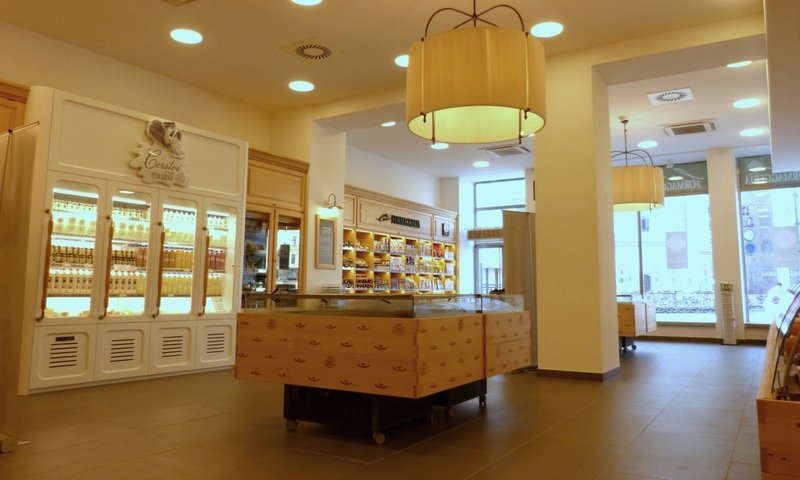 At La Formaggeria Gran Moravia stores you will find different types of Giuncata: with rucola, olives or the simple fresh one. Food energy 1160 kJ/280 kcal; total fats 22 g; saturated fats 13,4 g; total carbohydrates 1,2 g; sugar 1,2 g; protein 17,5 g; salt 0,55 g.
Following the classic Italian recipe, La Formaggeria Gran Moravia produces plain and flavored yogurt sold in small glass jars. 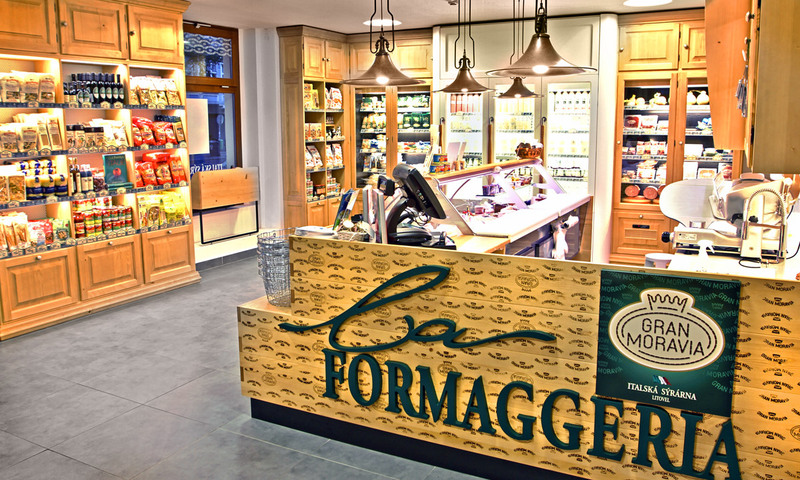 At La Formaggeria Gran Moravia stores you will find strowberry, apricot and blueberry yogurt, plain yogurt and as well as the latest varieties: caramel yogurt and apple-cinnamon yogurt. Food energy 354 kJ/84 kcal; total fats 3,7 g; saturated fats 2,9 g; total carbohydrates 4,5 g; sugar 4,5 g; protein 5,2 g; salt 0,1 g.
Food energy488 kJ/116 кcal; total fats 3,5 g; saturated fats 2,5 g; total carbohydrates 15,3 g; sugar 15,3 g; protein 5 g; salt 0,1 g.
Mozzarella is a young fresh cheese that is made from fermented milk. After extraction from the brine, this cheese has excellent snow-white colour on the surface and yellowish-lactic colour on the inside. Mozzarella cheese has a very elastic structure. In our Dairy Factory Mozzarella is produced in classic size, in a shape of small balls and in nodules, so-called nodini. Food energy 940 kJ/226 кcal; total fats 16g; saturated fats 7,3 g; total carbohydrates 2,7 g; sugar 2,7 g; protein 17,9 g; salt 0,1 g.
Like other whey cheeses, Ricotta is made by coagulating the proteins that remain after the casein has been used to make cheese such as the Verena dolce cheese. The Italian word Ricotta literally means “cooked again” and which highlights the unusual way of its production. The fresh ricotta has a refined and creamy flavor and a soft and granular consitence. Food energy 1000 kJ/242 кcal; total fats 22 g; saturated fats 13,7 g; total carbohydrates 3,9 g; sugar 3,9 g; protein 6,2 g; salt 0,2 g.
Milk whey is a liquid that occurs during the cheese production. Milk Whey becomes a part of our assortment, thanks to its valuable properties and positive influence on human body. 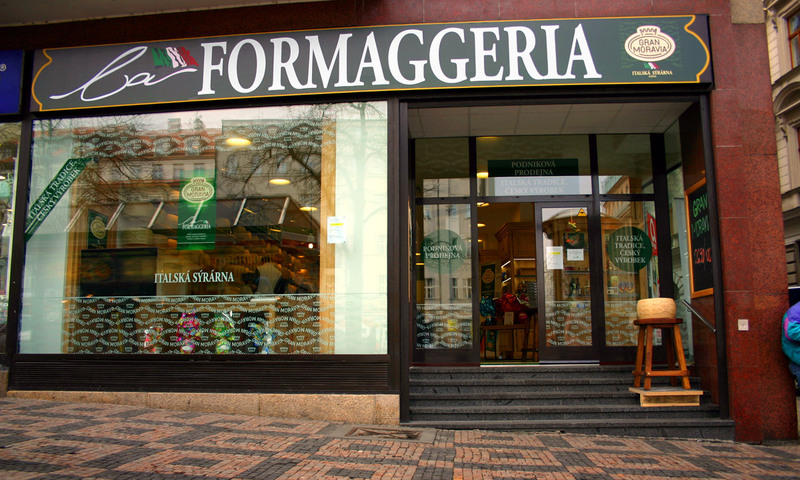 In La Formaggeria Gran Moravia stores you will find Milk Whey flavoured with vanilla, mango and lingonberries flavores. Food energy 124 kJ/29 кcal; total fats 0,5 g; saturated fats 0,3 g; total carbohydrates 5,3 g; sugar 5,3 g; protein 0,9 g; salt 0,1 g.
Food energy 158 kJ/37 кcal; total fats 0,3 g; saturated fats 0,2 g; total carbohydrates 7,9 g; sugar7,9 g; protein 0,7 g; salt 0,1 g.
Curd sold at La Formaggeria Gran Moravia stores is produced in our dairy factory in Litovel, following the traditional handcrafted recipe. Thanks to its long aging in sacks called tvarožnícy, the curd has a low content of water. 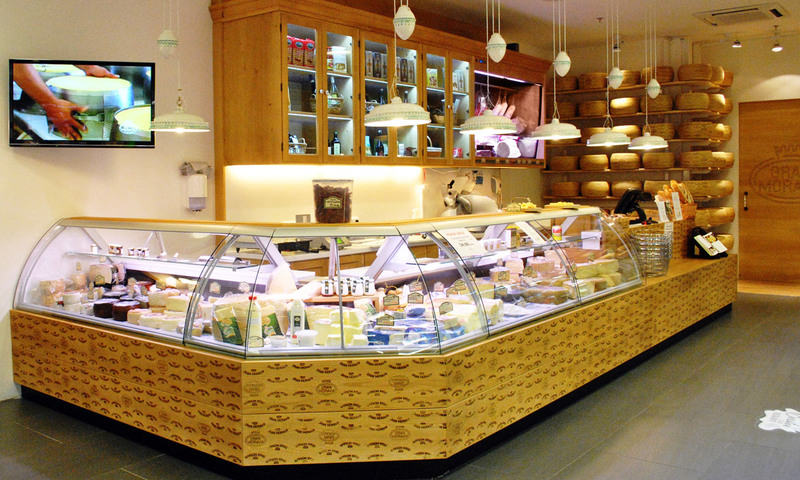 At our stores, you can find the curd already divided into plastic cans. Food energy 740 kJ/178 кcal; total fats 12 g; saturated fats 8,1 g; total carbohydrates 2,8 g; sugar 2,8 g; protein 13,3 g; salt 0,1 g.
The Verena dolce is a type of pressed cheese made in our dairy factory in Litovel from cow’s milk. It has a straw-yellow color, a sweet flavor, a soft consistence and it is usually identified by small holes evenly-distributed in the mold. It is perfect in cold and hot dishes, preferably served with sparkling wines. It can be a good starter, sliced in small pieces and covered with honey or spicy sauces. Food energy 1648 kJ/397 кcal; total fats 33 g; saturated fats 23 g; total carbohydrates 1,1 g; sugar 0 g; protein 24 g; salt 1,5 g.
This delicious and refreshing drink belongs to the category of fermented milk products, which are better digested than simple milk. Zákys has probiotic properties which positively influence intestinal microflora and increase the immunity of the whole organism. Regular use of zákys improves an intestinal mucosa and prevents osteoporosis. Food energy 243 kJ/58 кcal; total fats 2,8 g; saturated fats 2,1 g; total carbohydrates 4,2 g; sugar 4,2 g; protein 3,6 g; salt 0,1 g.
Food energy 323 kJ/77 кcal; total fats 2,7 g; saturated fats 1,8 g; total carbohydrates 10,3 g; sugar 10,3 g; protein 3,1 g; salt 0,1 g.